I used to think that heart rate monitors were only for people who were hard-core. I was wrong. 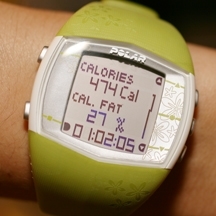 The Polar FT40 training computer does more than just measure your heart-rate. It also calculates calories burned, times your work-out, tells you if your heart rate was in fitness range or fat-burning range, logs your workout data…and it’s a watch with a light, an alarm, and does dry cleaning. OK, it doesn’t do dry cleaning, but it does do a lot. My FT40 is green and has a pretty floral decoration on the monitor face and the bands. It’s also available in beige and black with a cool techy design on it. The FT40 is very convenient and surprisingly comfortable to wear. You wear the monitor on your wrist like a watch (because it’s that too) and wear the transmitter belt just under the heart. When your working begins, hit the start button on the FT40 monitor and the monitor will measure and log your heart rate from start to finish. With the large digital face, it’s easy to read where your heart rate is and to compare it to your target heart rate. Once your workout is done, stop the monitor, take of the belt, then get ready to download your data! 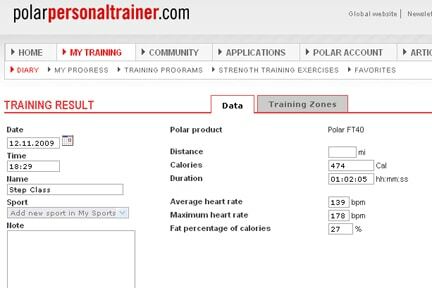 All of information from your workout is stored in your monitor, but included with most Polar products is membership to Polar’s exercise journal and online community at PolarPersonalTrainer.com. 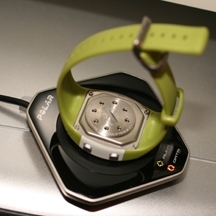 To download your workout data from the wrist monitor to the website, you’ll need the FlowLink accessory for your computer. Once the FlowLink is connected, simply place the monitor face-down on the link pad, and (after software/account set-up) it will automatically download your workout data to your Polar Personal Trainer account. Once your data is in your online account, you’re able to make notes about the date and time of the workout. It will automatically fill in the heart rate information for you. It will also give you a chart showing the training zones and showing what percent was in fitness and what percent was in fat burning. I’d like to mention that you don’t have to sync up your Polar monitor online. I mentioned it briefly earlier, but the monitor actual stores all the data and allows you to go back and look at the data. For example, I can go to the menu on the monitor (remember, the actual monitor is the watch-like device), scroll to data, and then training files, and all of my workout stats are listed by date. I can scroll through the dates and pull up the Calories, Cal. Fat %, Average and Max Heart Rates, time in the fat burning or fitness ranges, and total time. By wearing the monitor as a watch, you’re able to have your workout information with you so you can brag to your friends that you burned 500 calories and prove it! Here’s a completely wonderful surprise feature that I learned about my Polar training computer. One night, I was running on the Precor treadmill in the gym. I was wearing my Polar heart rate monitor and kept checking it to see what my heart rate levels were. I glanced at the Precor and noticed, “Wow…it’s showing the same number. That’s an interesting coincidence.” Then, I noticed that as I started running faster, and my heart rate on my Polar monitor was going up, the heart rate on the treadmill was going up too. Coincidence? NO! The Precor was picking up the signal and displaying my actual heart rate. Without any wires, set-up, menu button twiddling, or anything. So cool! One of the things I really like about using the Polar FT40 training computer, is that it allows me to see real-time, actual results of my workouts. Regardless of whether or not I can still see pudge in certain places, there’s no denying that I was working out and that my heart was doing something (plus, I see the calories I burned)! Also, by having the online exercise journal, it helps motivate me to get new data loaded every day. Plus, over time and as I keep logging more data, I’m actually be able to track my fitness improvement. If you think that Polar training computers are too expensive or complicated for just a ‘normal’ person working out, think again. They have heart rate monitors starting at under $60 and for moms-on-the-go, they have a special watch – the FA20 – that measures your steps and calories burned without requiring a chest transmitter. Polar has many products for the just-getting-off-the-coucher or the marathoner. Polar training computers are available in retail stores or online through Amazon. Disclaimer: This post consists of my (and/or fellow tester) opinions only. No compensation was given for this review/giveaway. I did receive a free Polar FT40 and FlowLink from the manufactuer or their PR agency to use and test for the purposes of this review. This did not affect the outcome of this review.